Making the switch from an antiperspirant to a natural-based deodorant can be a little scary. It’s hard to know which chemicals to avoid and which brand or product to choose. It’s a process that requires time and patience. But don’t worry, it’s totally worth it! First, let’s discuss the difference between antiperspirants and deodorant. Antiperspirant stops sweat from being produced by blocking the sweat ducts in your armpits. Bacteria is actually what causes body odor, not sweat, but a mixture of the two often heightens the scent. Deodorant masks the odor that is produced by a mixture of sweat & bacteria. It does not keep you from sweating as antiperspirant does. The main ingredient in antiperspirant is aluminum (aluminum compound). There’s thought to be a link between breast cancer and aluminum since you apply antiperspirant so close to the breasts. At this time there’s no conclusive evidence on this claim, however, the thought is still quite scary. Another reason that antiperspirant isn’t ideal is that it fights nature. Sweating is a natural bodily function. It helps your body regulate temperature and release toxins. Should we really be trying to stop our body from sweating by clogging our sweat ducts? 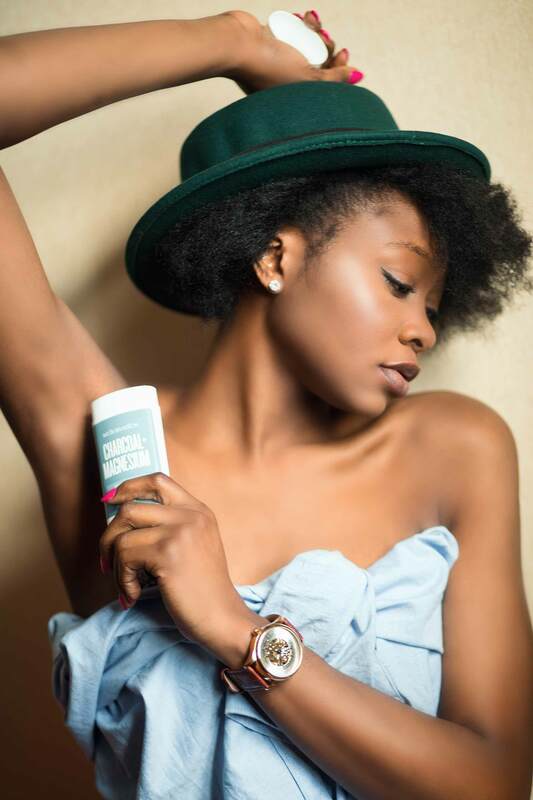 If you’re ready to make the switch to a natural deodorant check out our tips below! It’s important to conduct some research before you decide which natural deodorant brand(s) to try. Make a list of any ingredients that are known to irritate your skin and any chemicals that you want to ensure ARE NOT in the new product (ie: aluminum compounds, parabens, triclosan, etc.). Then begin your search. If you don’t know where to start, here’s a list of our top 5 natural deodorants. Once you’ve found a natural deodorant go ahead and give it a go. Pay attention to how the product works and feels, how long it keeps odor at bay for and if it irritates your skin. If you’re not comfortable applying the new deo directly to your armpits you can do a spot test on the inside of your arm first. Keep in mind that natural deodorants allow sweat to permeate the surface (which is good for you), however, it may irritate your pits at first. Some people set their natural-based deodorant with powder to prevent this. Once you switch from an antiperspirant to a natural-based deodorant your body goes through a detox period. During this time you’re going to sweat (and noticeably stink) more. This happens because the body is overcompensating for having the sweat ducts clogged for a while (by antiperspirant). It’s important to give your body time to adjust. The excess sweat & odor will eventually diminish, although not completely (hence why we need deodorant). If the first natural deodorant you try doesn’t work well for you, don’t give up and resort back to your old aluminum-based one. Try something else. Everybody’s body chemistry is different, and what works for one person won’t work for everyone. It’s all about taking the time to find which product works best for you. If traditional deodorant isn’t working (or the sweating hasn’t reduced) there are also powder forms to try such as The Greeench by Lush. Be sure to comment below if you’ve found a natural deodorant that works well for you or if you have any questions on which deodorant brands are cruelty-free! May contain affiliate links. All opinions are our own. Nothing stated above should be used in lieu of professional medical advice.